lace up everything is all over the place right now and is so cute. i have been dying to wear it all but being a new mom i can’t go without a bra right now (i know TMI). so i was able to put a twist on how to wear a fun lace up dress with the help of tobi.com. adding a tshirt makes this look comfy but yet still chic. also be sure to sign up for tobi’s emails and get 50% off your first purchase, you won’t be disappointed. speaking of being a mommy, wesley is getting so big & strong. he is starting to carry on a (make believe) conversation with me or with himself in the mirror. this mothers day, which was my first, he started to get his laugh. each day is a new adventure and i am loving every moment of it. 4 1/2 months going on being a grown man. Such a cool lace up! Good idea on the layering too. thank you amy!!! being a mom makes you have to come up with practical and innovated ideas. This dress is the cutest find! You look amazing and cool. Your little boy sounds so cute! 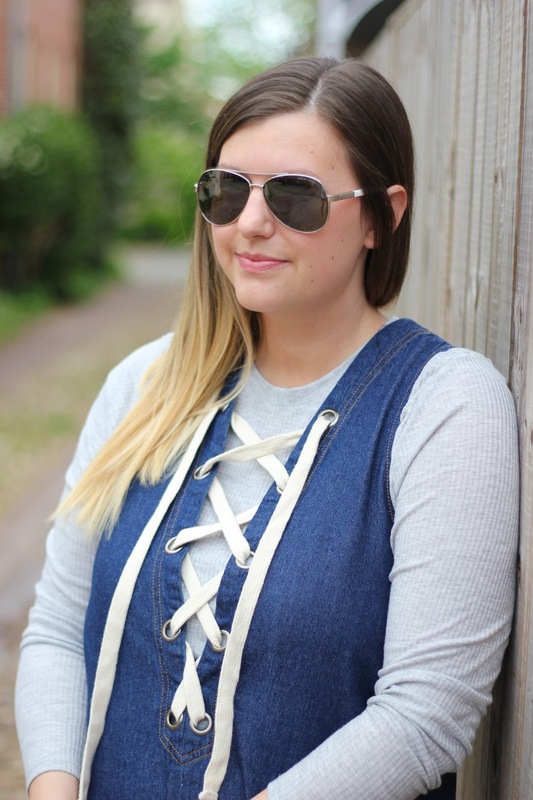 Loving this denim + lace-up combo! thanks ashley! yeah the lace up items are a lot of fun this season! i'm loving this denim dress! the lace up is so cute on it!! Wow really cute and very beautiful. So please keep update like this. Wonderful post. keep posting.. Dot Net Training Institute in Chennai | Dot Net Training Institute in Velachery. Good post. keep sharing…Android Training Institute in Chennai | Android Training Institute in Velachery.